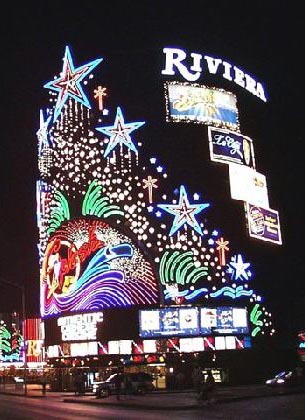 The Riviera (colloquially, “the Riv“) has over 2,100 rooms, many located in a 23-story tower. The casino has 110,000 sq ft (10,000 m2) of gaming space. Casino: Yes, More than 100,000 square feet. Casino games include Craps, Roulette, Blackjack, Baccarat, Let It Ride and Slots including Megabucks. There is a poker room. Race & Sports Book: Yes, a race and sports book, equipped with 35 flat screen televisions. Restaurants: The Riviera has the following dining options: Kady’s, The Riv Buffet, Kristofer’s, a food court and Queen Victoria’s English Pub . Entertainment: Entertainment includes: Crazy Girls, the Riviera Comedy Club and visiting headliners in the Royale Pavilion and a number of shows that play in the Le Bistro Theatre and Versailles Showroom, including Dr. Scott Lewis Outrageous Comedy Hypnotist and Sandy Hackett’s Rat Pack Show. Nightlife: Queen Victoria’s British Pub offers British-style food and drink. Spa: Yes, Achilles 24 offers multiple types of massages and services. Shops: 3 Lions Tattoo, Chocolate Heaven, Islands and Beyond, Just 4 Kids, Pearl Factory, Gifts Plus, Quality Leather and Luggage, Reflections Gifts and More, and ABC Stores. Wedding Services: Yes, the Riviera Royale Wedding Chapel offers a number of wedding ceremony packages. Convention Rooms:Yes, 160,000-square-foot convention center. Pets Allowed: Service animals only. In-Room Internet Access: All rooms have high-speed Wi-Fi internet access for a fee. Standard Room Amenities: Air conditioning, ipod/mp3 alarm clock radios, remote-controlled cable flat screen TV, desk, electronic door locks, in-room safe (for a fee), pay-per-view movies, refrigerator, wireless internet, telephone, voice mail. Policies: Rate is based on single or double occupancy. There is a charge for additional guests in room (maximum of four). Incidental Charges: The Riviera charges a mandatory $7.84 per room, per night resort fee. This fee is not included in your reservation and will be collected by the hotel at check-in. The resort fee includes: free access to Achilles Fitness Center (up to two people); up to 10 free incoming faxes received at the Riviera Business Center located in the Convention Center Lobby during regular business hours; free unlimited local and 800 calls placed from your room; free Le Bistro Late Night Entertainment Tuesday – Saturday, 9 p.m. – 12:15 a.m.; free access to Riviera Tennis Courts and Oasis Pool Complex; free towel service at the Oasis Pool Complex; free enrollment in Club Riviera Players Club Win up to $1,000 in Free Slot Play with new enrollment; free drawing ticket for free slot play, shows, rooms & more; 25% off entry to $40 for $20 slot promotion (value $5 minimum); 50% off drinks at the Le Bistro Bar; 50% off tickets to the Riviera Comedy Club (must purchase tickets through Riviera Box Office); special discounted rates for other shows at the Riviera (must purchase tickets through Riviera Box Office). Hotel requires a credit card or a cash deposit of $50 per day, per guest for incidental charges.